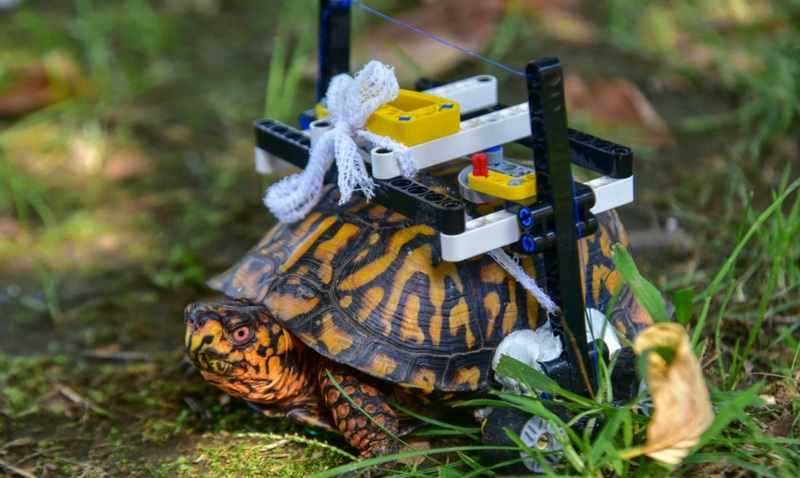 Veterinarians at the Maryland Zoo outfitted an injured Eastern turtle with a wheelchair built from Lego. An employee of the zoo found the turtle whose shell had been injured in a nearby park. “He had multiple fractures on his plastron, the bottom part of his shell. Because of the unique placement of the fractures, we faced a difficult challenge with maintaining the turtle’s mobility while allowing him to heal properly,” said Ellen Bronson, the zoo's sensior director of animal health. Zoo officials say there aren’t devices small enough for turtles to use so they got creative and drew sketches of a customized wheelchair. The sketches were then sent to a friend, who is also a LEGO enthusiast. “The sketches proved to be a success and the turtle received his very own multi-colored LEGO brick wheelchair just a few weeks after surgery. The turtle is roughly the size of a grapefruit. The small LEGO frame surrounds his shell and sits on four LEGO wheels,” said Garrett Fraess, veterinary extern at the zoo.